With over 50 years of combined sign experience, Effective Sign Company has provided signs of all shapes and sizes. 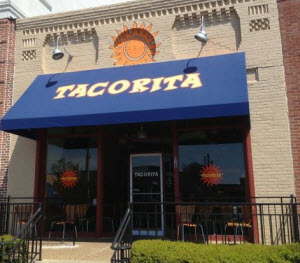 From LED signs and channel letters signs to neon signs, awnings, business cards and even billboard advertising. As a full service sign company, Effective Sign Company can assist you with all your sign needs, including sign design, surveys, sign permitting, sign fabrication, sign installation, promotional materials, business stationary printing, awnings and of course, ongoing sign maintenance. In addition, we offer a full range of custom signage including LED design, fabrication, lighting maintenance, project management, and installation. We are here to help you increase your exposure and visibility. At Effective Sign Co. we have a team dedicated to not only help you meet today's needs, but also tomorrow's possibilities. Your SIGN should be EFFECTIVE! Metal offers a natural style and beauty as ancient as our desire to create. 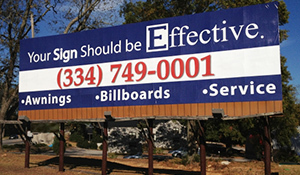 Our mission at Effective Sign Company, llc is for complete customer satisfaction. We achieve our mission by creating value for our customers and serving our clients with respect and professionalism. We will continue to seek improvements in technology, quality signs and letters, accountability, and customer service to meet and exceed our client's needs. We service the cities of Auburn and Opelika, Auburn University and surrounding areas as well: Montgomery, Dadeville, Alexander City, Lee County, Valley, Lanett, Tuskegee, Troy, Phenix City, Valley, and Columbus, GA.